Happy Thanksgiving, Substandard Sitcom “fans.” I hope you had your fill of turkey, pumpkin pie, and pajama boy nephews who smarmily tried to convey how the ACA is our only hope. Let’s jump right in to the conclusion of last week’s episode. Vic is walking up to JVL’s room. The door is ajar and you can hear noise coming from the room. Vic pokes his head in. JVL: And see, this is how you can tell if a dresser is made with quality or not. Maria: (giggles) Mr. Last, I have so much to learn from you. Vic: How do you tell if a dresser is high quality? Maria: Just pull out the drawers and examine them. If they’re glued, stapled, or nailed, they’re garbage. If the joint is a dovetail joint, you know it’s a good dresser. Vic: So, what sort of joint does this dresser have? JVL: I’m writing a strongly worded letter to the Norwegian Cruise Lines CEO. But first, Maria, allow me to rank the different styles of dovetail joints. The secret mitred dovetail joint which is also known as a full-blind mitred dovetail. Why hide a detail which screams quality? The secret double-lapped dovetail joint. It’s still on the inside, but you can see a little endgrain on one edge of the joint. The sliding dovetail joint, aka the French dovetail joint. It’s sliding, it’s French, but at least it’s not just glue. The half-blind dovetail joint which is sometimes called a single-lap dovetail. Not a common joint. It’s used most frequently to attach the front of dresser drawers. Uncommon, but very necessary. The through dovetail joint which is sometimes called an English dovetail joint. It’s not showy, but it’s sturdy. Like the British Empire, the sun never sets on the English dovetail joint. He continues dictating the letter to Maria. Cut to the theater where the Substandard episode will be recorded. The seats are relatively full of Substandard Extended Universe members who have been looking forward to watching the hosts rank brands of drywall live for months. Nay, years. Jake Tapper is hoping nobody recognizes him in his disguise. He’s wrong. The fake nose is fooling nobody. Ben Sasse is holding court off to the side of the bar. He’s waxing eloquent about something. The Wendy’s social media representative is wondering why she was asked by corporate to attend this event. For those of you who don’t know, it’s because of Megathread. Speaking of Megathread, @fiskasaurusrex is cautiously keeping it going by liking everything and farming GIFs for witty banter. @Ryan_Kinney11 is amazed that Vic’s head looks even bigger in person than on Facebook Live. @carmella_nichole is devising a new sassy friends edition of the Substandard, and @MKNewsom is fighting with @JasonCooper22 over whether Houston or Cincinnati is the best place to live. Parenthetically, there are a surprising number of Texans and Ohioans in the Substandard EU. JVL and Maria are dressed in “podcast attire.” JVL forgot his podcast glasses in his room, so he has sent her back to grab them. Without Maria, JVL is left alone to ask if the bar has maple beer. Vic is looking for Sonny who is AWOL. Mike Warren is standing by, as usual, hoping to be chosen as an alternate. Jim Swift is present as his contract dictates but is continually nodding off to sleep. Word is he only agreed to come on the cruise so he could get some time to sleep. He hasn’t gotten more than three hours of uninterrupted sleep since his twins were born. JVL: Did you check the casino? Vic: That’s the first place I looked. He’s not there. And I tried texting him, but there’s no service out here. Mike Warren: Hey, I’m happy to step in if Sonny doesn’t show up. JVL: Is Jim Swift around? Maybe he can step in for Sonny. Mike: I’m right here. I’ve been on the podcast before. I killed. Vic: (ignoring Mike) Oh my gosh, is that Mark Hemingway? I had heard he was so revolted by the sexual abuse scandals that keep coming out that he was remaining in his Martin Luther costume as he called our nation to repentance. But I’ve not actually seen it in person. JVL: It is a sight to behold. I’d ask him to join the podcast, but I’ve heard the 95 theses so many times I have them memorized. Mike: Hello, I’m right here, guys. JVL: I wonder how hard it is to keep his tonsure so neat. Cut to the middle of the live podcast show. Hannah Yoest has ably stepped in as a substitute host. But at this particular moment each member of the audience has recoiled in horror at JVL’s disturbingly accurate Idi Amin impression. Everyone except Jim Swift, that is. He’s sound asleep, but he would have recoiled in horror too had he been awake. Vic: What can I do to make sure you never do another impression of a non-white person again? JVL: What? I thought that was pretty good? Want to hear my James Hong impression? Hannah: (yelps) No! Please don’t. Vic: I feel like I need to take a shower. Let’s call that a wrap. I….I just can’t say it’s fine though. Let’s end it a different way today. Cut to JVL, Vic, and Sonny walking off the boat. After a week at sea, the Weekly Standard crew is exiting the cruise ship and reflecting on the week. Immediately after the live Substandard show JVL started coming down with what he believes was norovirus. He, of course, diagnosed himself so we’ll never be sure. Maria unsurprisingly got whatever he got as well. Although he has no evidence JVL blames Sandy for infecting him. JVL: I’m so glad I’m finally better. I just don’t know how I got sick. I should have gone full Howard Hughes. Next time I definitely will. I even packed for it. Sonny: Never go full Howard Hughes. JVL: Nevertheless, I’m so glad to be getting off this ship. What did I miss, Vic? What was your favorite part of the cruise? Vic: I loved seeing Ben Domenech running around trying to get Jim Swift to stand on a scale. What’s with that guy? I can’t believe he came on the cruise just because he wanted to get an accurate weight of Jim Swift. There’s gotta be a swift boat joke there somewhere. Sonny: I bet most garbage Millennials don’t even know what a swift boat is. Vic: Probably not. How about you JVL? What was your favorite part? JVL: I really enjoyed seeing the pods of whales from my balcony. Hey, is it true that Captain Bill Dwyer saved a child from drowning in the pool? Vic: Well, he actually saved a child and the lifeguard who went in after him. Yeah, he dragged both out of the water and gave them both mouth-to-mouth. Unreal. JVL: Did I also hear that he launched a life boat to save someone who fell over the railing and into the ocean? Vic: Yeah. He did that too. JVL: How about the beached whale? Is that true? Vic: (getting a little irritated at all the “Captain Bill Dwyer is a manly man many cubits tall who slayed the dragon” stuff) Yeah, yeah. He saved a beached whale. But when you were sick you totally missed my act of heroism. JVL: Yeah, what was it? Vic: I found a split infinitive on the dinner menu. I reported it to the staff. You should have seen how relieved the staff was to reprint a grammatically correct menu. Sonny: I think you’re confusing white-hot anger with relief. But, I want to go back to the balcony thing. You had an exterior room? JVL: You didn’t? Well, it’s not like it mattered. Nobody saw you the whole time. Did you actually leave your room? Vic: I saw him at the buffet a few times. Sonny: Between the free room service food and the cheap alcohol, I barely left my room. The buffet and room service food is phenomenal. Even better than Chili’s. Why did I ever hate cruise ships? I get to sit in a room and watch romantic comedies and order delicious food, all while seeing nobody. I can’t believe the Weekly Standard paid for me to do this. 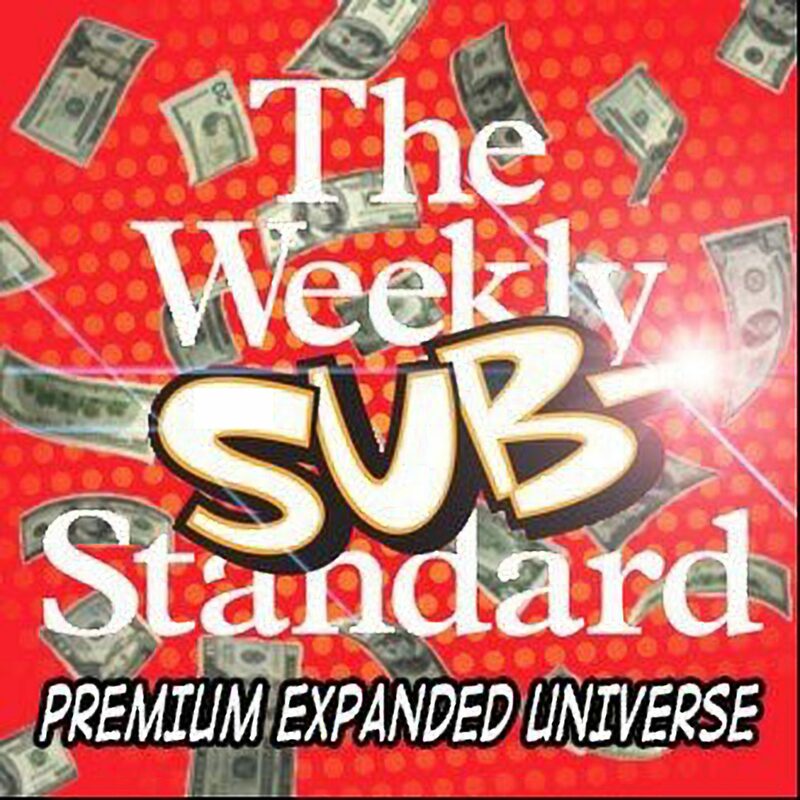 Vic: The Weekly Standard only covers the cruise if you make your appearances. And there’s no way they’ll actually pay for the cruise let alone actually give you money for coming without making those appearances. JVL: Sonny, it sounds like you just paid $3500 to sit in a room for a week. On a cruise ship. Sonny: You’ve got to be kidding me.